Loose and spontaneous, this (mainly) live album is a meeting of three of the greatest guitarists in the world for an acoustic summit the likes of which the guitar-playing community rarely sees. 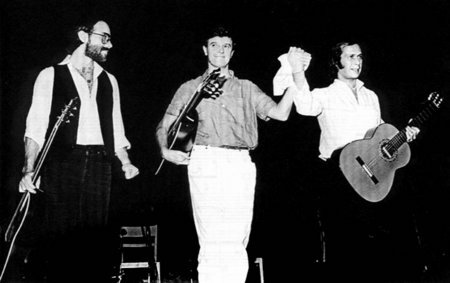 Broken up into three duo and two trio performances, Friday Night in San Francisco catches all three players at the peaks of their quite formidable powers. 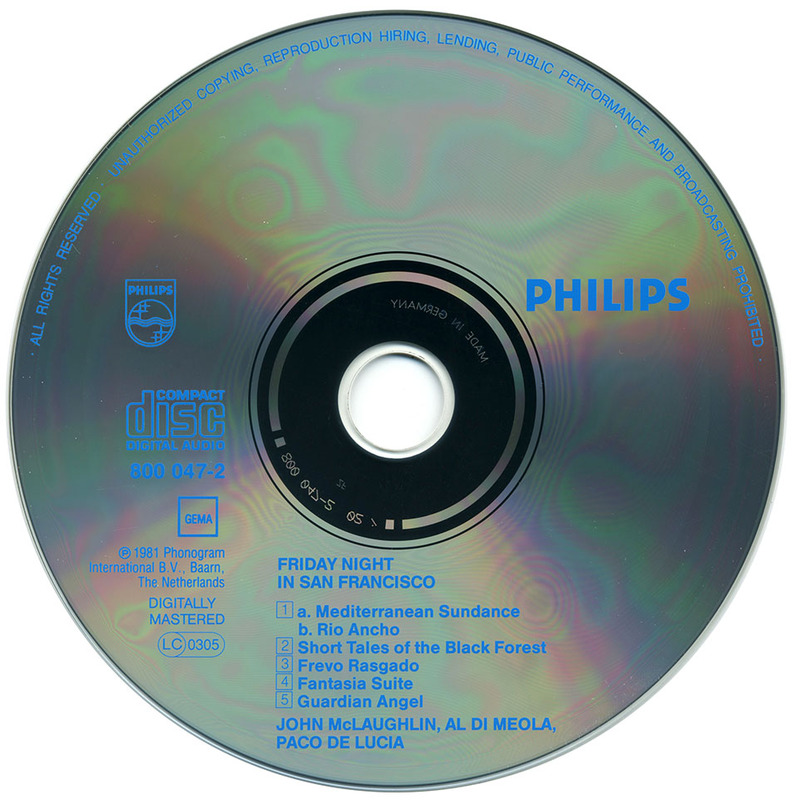 The first track features Al di Meola and Paco de Lucía teaming up for a medley of di Meola's "Mediterranean Sundance" (first recorded by the duo on di Meola's classic 1976 album Elegant Gypsy) and de Lucía's own "Rio Ancho." It is a delightful performance, full of the fire and inhuman chops that one expects from two players of this caliber. However, the two guitarists obviously have big ears, and they complement each other's solos with percussive, driving rhythm parts. 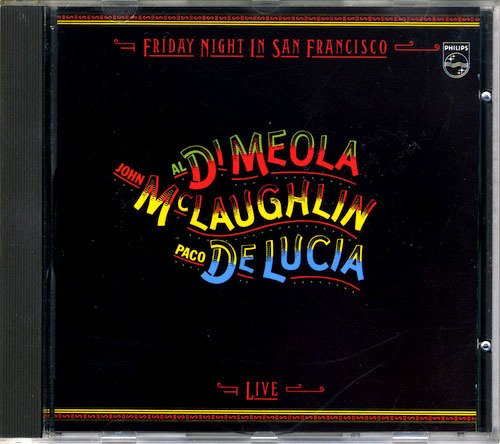 There is a laid-back, humorous element to Friday Night in San Francisco as well, best witnessed in di Meola and John McLaughlin's performance of Chick Corea's "Short Tales of the Black Forest." Rapid-fire licks from the pair soon give way to atonal striking of the body of the guitar, running picks along the strings, etc. Before the farce is completed, they have played a blues and quoted the Pink Panther theme. 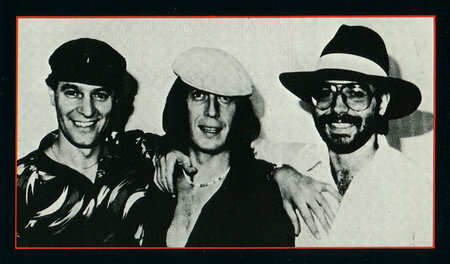 It is funny stuff, and it serves to dispel the image of the trio, especially di Meola, as super-serious clinicians more concerned with technique than music. 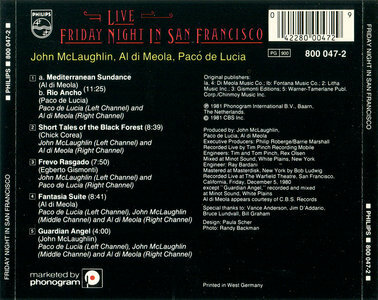 The other great piece of evidence against such a narrow-minded claim can be found in both the quality of the compositions featured on Friday Night in San Francisco as well as the sensitivity and dynamic variation brought to the performances. A perfect example of this is the sole studio track, a McLaughlin composition entitled "Guardian Angel" (the opening theme of which is taken straight from "Guardian Angels," a song that appears on McLaughlin's 1978 Electric Dreams album). It is a fine piece, and one that features a haunting melody as well as some of the best solos on the record. 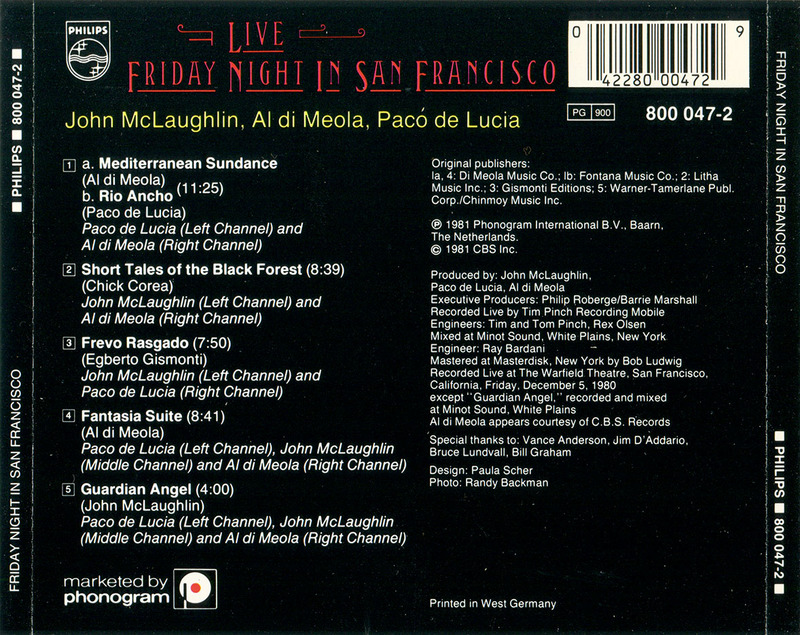 All in all, Friday Night in San Francisco is a fantastic album and one of the best entries in all of these guitarists' fine discographies.